KUALA LUMPUR: Mah Sing Group Bhd is confident the local property market is sustainable as the current buying activities are backed by economic fundamentals and genuine purchasers. “Despite Bank Negara’s measure to cap the loan-to-value ratio at 70% for third and subsequent house purchase, the prevailing low interest rate, healthy employment market and the fact that property investments have proven to be a reliable asset class will continue to sustain and drive the sector,” group managing director and chief executive Tan Sri Leong Hoy Kum said. The Government’s Economic Transformation Programme to pave the way for the country to become a high-income nation will also boost demand for properties in economic hot spots that include the Greater Kuala Lumpur, Penang and Johor. Leong said careful market studies to match supply with demand was necessary to make sure that the products offered meet market needs in terms of concept and design. “It is important to invest in research and development to continuously create a healthy, sustainable and eco-friendly lifestyle. Other attributes include good locations, unique concepts and on-time delivery of quality products,” he told StarBiz. Leong said gated and guarded landed properties seemed to be the most sought after, both for new launches and the secondary market. “Besides a good location, buyers today place more importance on security, concept, design and lifestyle. “The current price trend for link homes in good locations are approximately RM700,000 onwards for double-storey link homes and RM1mil onwards forthree-storey link homes,” he added. Leong said Mah Sing was confident of chalking up sales of more than RM1.5bil this year after having turned in RM1.02bil for the first seven months this year from projects in the Klang Valley, Penang and Johor. As at June 30, the company had unbilled sales of RM1.17bil, nearly twice the revenue recognised in 2009. “Our landed properties generally attract local buyers, and our serviced residences have a higher quantum of foreign buyers due to ease of maintenance,” Leong said. As part of the company’s marketing strategies, Mah Sing takes part in property exhibitions locally and overseas as they are good brand-building campaigns. “We look forward to the upcoming Star Property Fair on Nov 19-21 at the Kuala Lumpur Convention Centre, and will be showcasing some of our latest projects at the fair,” he added. The company currently has 15 ongoing projects while 10 projects are at various stages of planning. Its existing projects include One Legenda and Hijauan Residence in Cheras, Garden Residence in Cyberjaya, Perdana Residence 2 in Selayang, Icon Residence Mont’ Kiara, Aman Perdana in Meru-Shah Alam, Southgate, StarParc Point, iParc@Bukit Jelutong and iParc 2@Shah Alam in Kuala Lumpur and Klang Valley, Legenda@Southbay and Residence@Southbay in Penang island as well as Sri Pulai Perdana 2, Sierra Perdana and Austin Perdana in Johor Baru. Those in the drawing board include M Suites @ Jalan Ampang, Kinrara Residence and Kinrara joint venture project, Garden Plaza in Cyberjaya, Star Avenue@D’Sara in Sungai Buloh, Icon City in Petaling Jaya, iParc3@Bukit Jelutong, and Bayu Sekamat in Hulu Langat in Kuala Lumpur and Klang Valley as well as Southbay Plaza and Icon Residence in Penang island. Mah Sing is previewing its second project in Cyberjaya, namely Garden Plaza comprising Garden Suites (residential) and Garden Retail which are lifestyle retail shops. The project-awareness exercise has attracted more than 2,000 registrants for the Garden Suites. Comprising fully-furnished small to medium-sized units that will be furnished and in move-in condition, the units are targeted at both users as well as investors looking to tap the vibrant student population in Cyberjaya which is currently in excess of 17,000. The indicative price for the smallest unit of 500 sq ft starts from RM236,800 and there are flexible sizes to meet various requirements. Leong said the company’s medium to medium-high end properties, including M-Suites@Jalan Ampang, received overwhelming response during its preview. M-Suites offers freehold apartments from 502 sq ft to 1,630 sq ft which are designed specifically to provide easy ownership and ensure long-term rental demand – criteria which appeal to both investors and residents alike when investing in the city. The residential landed projects in Cyberjaya, Selayang and Bandar Kinrara had also attracted positive response. Garden Residence in Cyberjaya comprises two- and three-storey superlink and semi-detached as well asthree-storey bungalows. The gated and guarded project has been very successful, with sales hitting RM419mil as at July this year. Meanwhile, Perdana Residence 2, a gated and guarded project in Selayang, achieved more than 98% in take-up rate since its launch in March. Kinrara Residence, a mixed residential development comprising super links, semi-detached units and executive bungalows priced from RM708,800, has also garnered positive response. The gated and guarded development offers a communal lifestyle living with a clubhouse equipped with facilities such as swimming pool, wading pool, changing rooms, gymnasium and a community centre. PETALING JAYA: After several years, the International Real Estate Federation (FIABCI) has decided that it is not going to have a specific theme for its Malaysia Property Award (MPA) this year. “There won’t be a theme for this year’s property awards because we don’t want to see developers over-emphasising on certain areas only,” said FIABCI Malaysia president Yeow Thit Sang (pic). Yeow said FIABCI Malaysia also aimed to create more recognition for small, unheard of developers not just locally but also internationally. “There are many developers in Sabah and Sarawak, for instance, that nobody has heard of but are of world-class standards. “By participating in the MPA, and going on to represent the country on the global stage at the International Prix d’Excellence, helps build their reputation and credibility,” he said. FIABCI Malaysia is also more than just an organiser or annual property awards. According to Yeow, it was often a “voicebox” for property players to engage with the Government. 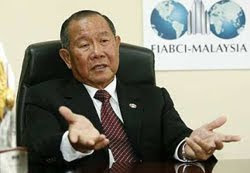 Yeow said during the global financial crisis that occurred in September 2008, FIABCI Malaysia’s views were consulted by the Government on matters relating to the stimulus package. On the awards, Yeow said all of this year’s entrees deserved top marks for their projects and their efforts. “The standard of the local property sector has increased tremendously,” he said, adding that there were over 50 entrees for this year’s MPA. Yeow said over the years, FIABCI Malaysia had been encouraging local developers to reduce its impact on the environment as much as possible. “Environmental awareness is a global issue. Local developers that consider the wellbeing of the environment into consideration will go a long way,” he said.